AWS AMIs refer to pre-configured bundled software that has the necessary information to launch an EC2 instance. We can say that AMI refers to a root device for the instance; when an EC2 instance is launched from that AMI it will have all the OS, software as well as the applications which were bundled when that AMI was created. 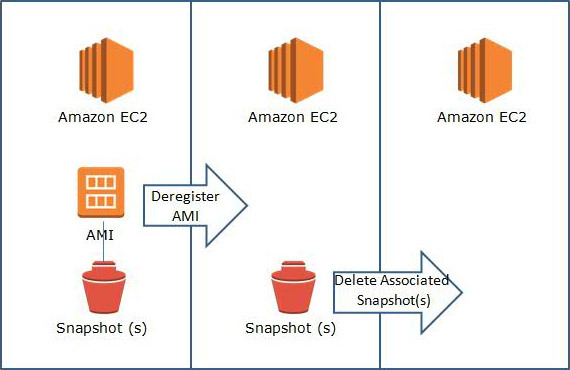 If you create an AMI from an existing instance, once the AMI is created, AWS creates a snapshot of the root storage as well as all the EBS volumes that are attached to the instance. When you deregister the AMI, it is simply deleted. However, all the snapshots that were attached to the AMI remain and need to be deleted manually. The diagram below illustrates this concept. If you do not manually delete snapshots after deregistering an AMI, they will continue to incur costs. This article delves into how to deregister AMIs as well as delete snapshots. In addition, we provide you with an automated script that deletes all snapshots that are associated with a respective AMI while deregistering the AMI. Go to the AWS EC2 console and AMI section. Select the desired AMI. Next, select the ‘Deregister’ option in the ‘Actions’ tab. Select the ‘Continue’ option to deregister. The AMI is now deregistered. To delete the snapshot, select the snapshot and click on the ‘Delete’ option from the ‘Actions’ tab. At times, it can be tedious to delete an AMI and then locate all of its associated snapshots in order to delete them, as well. 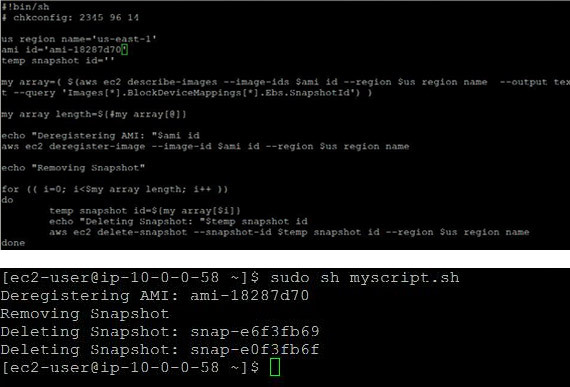 Taking that into consideration, a script has been created that can delete both an AMI and its associated snapshots, simultaneously. All you need to do is enter the AMI ID into the script. Two scripts have been created: one by PowerShell Script for Windows machines and the other by and for Linux. It is assumed that the AWS CLI was installed on both machines/instances and that the access credentials were set for the AWS account. If you run these scripts from an EC2 instance, it is recommended to use the AWS IAM Role for better security. There are two types of AWS AMIs: EBS-backed and instance store-backed. In either case, when an instance is launched the root device is either the EBS volume or ephemeral storage, respectively. 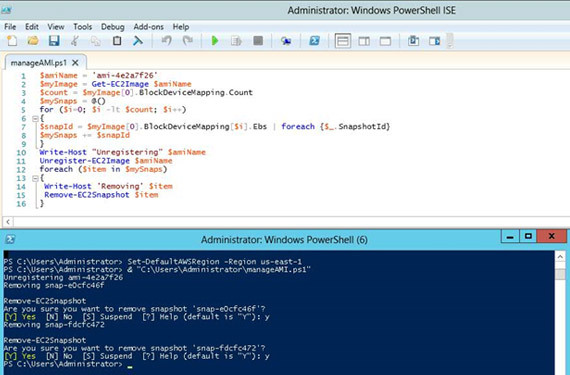 It is recommended to use snapshots at the application configuration level change for regular persistent storage backup. This could be useful for future instance launches if you want or need to create an AMI. As explained above, when an AMI is deregistered, it does not delete its associated snapshots automatically, resulting in you having to delete them manually or by using the scripts outlined above. This script was given as-is. You can use it for any purpose, redistribute it or modify it. We offer no warranty, expressed or implied, so we simply ask that you understand that it may not work.